when we love doing it so much? Find out how one Managing Broker tripled her team in size and capacity while coaching with Tammy one:one, implementing new systems for expansion individually and collectively. How Tammy helped Tommy Bahama ® – breakdown silos while increasing internal communication and building solid plans for future growth. How Tammy helped Alan Regala, CEO Shelf Genie — To optimize his team — increase performance levels and establish targets and measures for increased sales. How one business leader moved from running a multi-million dollar company to launching a startup dream 42 years in the making. Leaving behind what others can only dream of building to start living the life of his dreams, on his own terms. 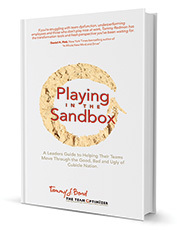 Discover how one team broke down cubicle walls and opened broken lines of communication through bold truth telling and authentic visibility on the team with Tammy’s powerful coaching and team facilitation.